Fixed the issue with authenticating the user caused by a recent change at Adorama's back-end. Fixed the issue with updating the plugin. NOTE: Lightroom must be restarted after applying this update. Implemented chunked uploads for better handling of large files. Improved handling of expired galleries. Fixed HTTP Error 500 during the upload. Export Dialog: fixed album date display. Fixed the error when running several concurrent export operations. Added a configuration option allowing to suppress upload errors until the very end of the export operation. Export Dialog: fixed default state of the password field (Mac OS). Improved performance of album related operations. Export Dialog: Albums descriptions now display correctly. Export Dialog: album creation dates now display correctly. Export Dialog: minor improvements of the album caching algorithm. Fixed the intermittent "Assertion failure" when uploading photos. Fixed an intermittent failure to upload photos. Publish Service: New major feature - Reclaim Photos. 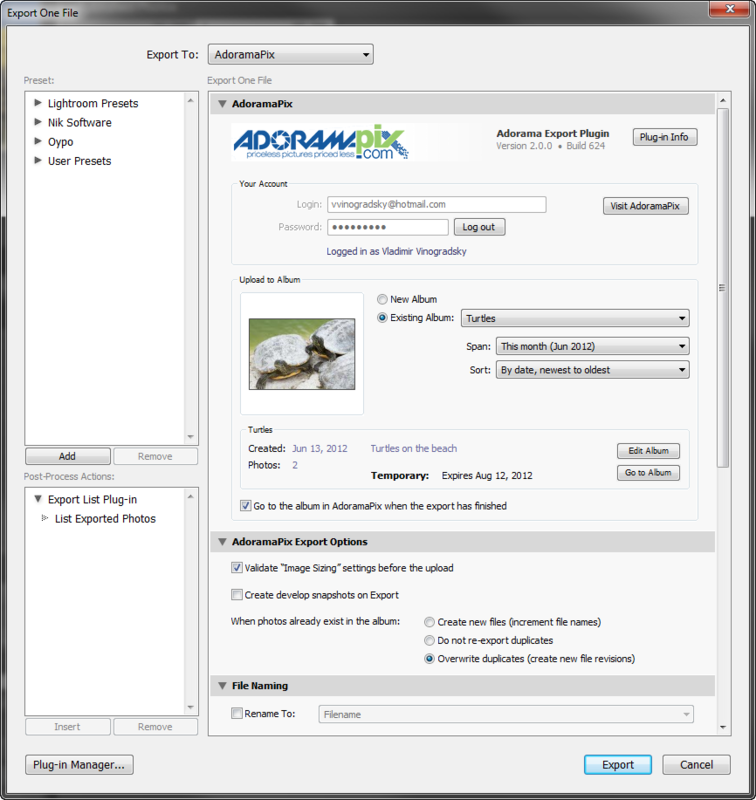 Now you can download your photos from AdoramaPix back to your computer and rebuild your publish service. Available to registered users only. Fixed: choosing the "Ignore Upload Errors" option after an initial failure caused subsequent uploads to fail. Fixed the "attempt to index global 'attributes' (a nil value)" error when a photo exceeds the maxiums file size allowed by AdoramaPix. Now recognizes Plus and Pro accounts and enables them to uploads images of an unlimited size. Regular AdoramaPix accounts have a 60 Mb per photo limit. Fixed issues with publishing photos when using a particular combination of album-specific resize options. Opening the Lightroom Publishing Manager panel and logging into the service no longer triggers the "Not Saved" status unless you actually modify one of the publishing options. Fixed the issue with being unable to rename unpublished albums. 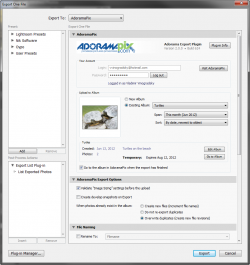 Publish Service: now "Check Photos" clears AdoramaPix Metadata fields if photos are no longer published through the AdoramaPix publishing service. Publish Service: now "Associate Images" populates AdoramaPix Metadata fields correctly. Fixed the "attempt to index local 'albumProperties' (a nil value)" error when attempting to create a new album. Publish Service - All "extras" functions (such as Import Albums, Associate Images, Check Photos, etc.) are now available right from the Publish Service Settings panel within Lightroom Publishing Manager. Extras - Associate Photos: The photo matching algorithm has been significantly improved to provide a faster and more accurate pairing, particularly when file names contain spaces and other non-alphanumeric characters. Extras - Associate Photos: Added a new pairing conflict resolution method - now you can prioritize pairing of rendered copies (JPEG and TIFF) over raw originals. Improved handling of unexpected server errors. Added suport for TIFF uploads. Edit Album Dialog: the description field now resizes automatically so that it fills the available space as you resize the window. Export Presets: Fixed the issue with retrieving the Password field when working with multiple accounts. Better validation of album names. Remove the AdoramaExport.lrdevplugin folder, then install the update using the new installation packages. Implemented a workaround for the situation when the server initially reports a problem with the uploaded image, however given enough time, it confirms a successful upload. Improved the handling of situations when the server rejects uploaded photos. Fixed an issue with updating the catalog users upgrading from an older version of the plug-in. Fixed the "access to an undefined variable 'now'" error when installing the plugin for the first time. Fixed time-out errors when uploading photos under Mac OS. Export Dialog: a few minor fixes. Fixed the "Assertion failure" error when uploading multiple photos. Fixed an error (Lightroom 2 only) when uploading photos. NOTE: Version 2.0 now requires a registration fee of $15 (USD). Added metadata fields for keeping track of photos that were uploaded via the plug-in (you can find them on the Metadata panel as AdoramaPix Metadata). Export Dialog: Now displays status and expiration date of temporary albums. Publish Service: Added support for Publish Services in Lightroom 3 and 4. Library - Extras: Implemented the ability to import the album structure from AdoramaPix into Lightroom's publish service. Library - Extras: Associate online photos with photos in your catalog. Library - Extras: Customize album cover photo. Fixed a number backward compatibility issues with Lightroom 2. Fixed the "Unexpected server error" when attempting to create a new album with a duplicate name. Fixed the issue with not prompting the user for the album name when creating new albums. Fixed another compatibility issue introduced after a recent change in Adorama's web service. Added the validation of the Image Sizing settings. The plug-in will issue a warning if the dimensions of rendered photos are outside the 500 - 10000 pixels range. Redesigned the layout of the Export dialog to provide room for album descriptions. The file size limit has been increased to 60MB per single photo to match Adorama's specifications. A quick fix for Mac OS users. This update resolves the issue with uploading photos. Fixed the "Unexpected server response" error when logging in. Added the ability to rename albums and modify album descriptions from the Export dialog. Changed the version number format to the classic form. Fixed some glitches in the authorization process. Numerous cosmetic improvements and tweaks. Fixed a Mac specific issue with album drop-downs extending beyond the right side of the export dialog. In Lightroom 3 Beta, the photo lab logo is back on top of the Export dialog. Now the plugin is compatible with Lightroom 3 Beta. Now User settings are saved when you close the Export dialog. Fixed the issue with running the plug-in when there are no albums in the account. Plug-in information section has been relocated to the Plug-in Manager. Redesigned the option for creating a new album. Added icons indicating the plug-in state. Added a “Check for Updates” button, available in the Plug-in Manager. Instead of the FTP password, the plug-in now relies on your web password for user authentication. From now on use your regular AdoramaPix password to log in. User name and password are no longer blanked out after you install a newer version of the plug-in. Implemented dynamic querying of gallery information from the server to display the number of photos in the selected gallery. For temporary galleries, their total size and the expiration date are displayed as well. Gallery options are now located in their own group box. On my MacBook I can get to -/library/application support/Adobe and then the trail ends. There is no /LR/module. I only have the Beta version on this machine which may be the reason. But where should I put the plugin file? Sometimes the Modules folder needs to be created manually, but I am not sure why the Lightroom folder would not be there. Technically, you can install the plug-in in any folder where you unzipped the plug-in package, using the “Modules” folder simply saves you a few extra steps, as you won’t need to tell Lightroom explicitly where the plug-in has been installed. Now when you export photos you should have an option for AdoramaPix. The download link from Lightroom Exchange is currently broken. I ended up with a 404 on this site and had to search for this page to download. Thanks for letting me know! I fixed the link, please try downloading now. Thanks for the plug in. Just a question will the image quality degrade since it is in jpeg vs. tiff? Also the jpeg quality is set to 60 should this be higher or lower and my pixel per inch is at 400. I am new to photography and would like to keep as much of the quality as possible. Thank you. For photo printing there is no quality loss in JPEG if you are keeping quality at 100% (you’ll want TIFF only for print production), and most of times 100% quality is an overkill. You can safely reduce ppi to 240, however bump up quality to 80-90%. Don’t forget to calibrate your monitor and apply the ICC profile (i.e color space) matching the paper type you’ll be printing on. You can download ICC profiles from Adormapix.com web site. Any chance of LR 3.0 (or 3.2 RC2) support for OS X soon? Thanks! Now that 3.2 RC is out, it’s just a matter of time before I update all of my plugins to be compatible. I am also hoping there will be enough users willing to help out with beta testing, then I should be able to complete the migration in about two weeks. Actually, version 1.9 is now LR 3.2 Release Candidate compatible. If someone can test and provide feedback, that would be much appreciated. I also am wondering about the Lightroom plugin for OS X. Can’t wait for that to be fixed! Absolutely LOVE it! This plugin enables you to upload straight to Adorama from Lightroom, essential if you want to streamline your digital workflow and get your prints “from the cloud”. All the settings you need are in the plugin export dialogue with the default sRGB profile for Adorama. Hi, I installed adorama pix plug in for my Mac OS. How do I import files into it for further upload to Adorama Pix ? The grab and drop does not work.